Two of the most fun and most important parts of the holiday season are giving gifts to family and friends and dorm room decorating. For both of those super fun things, you have a pretty long college dorm checklist. You need to think of the perfect gift for your best friend back at home and for mom and dad. You also need to think of all of the dorm necessities you need for your dorm room decorations. After all, you want your dorm room decor to stand out for the holiday season and make your college dorm room feel like a home away from home for the holidays. Wouldn't it be nice to take care of both your gift wrapping and dorm room decor with one dorm essentials item? With our Chocolate Glitter Ribbon, it is possible! 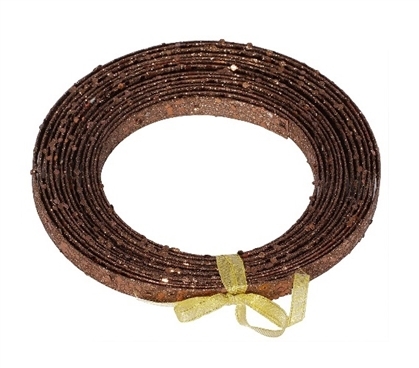 Our Chocolate Glitter Ribbon is a thicker and sturdier ribbon, allowing you to use it for both your dorm room decor and gift wrapping. Adding a bow made of this dorm necessities item to a gift for a family member makes it the perfect finishing touch to show them how much you care. Added the garland, mini dorm lights, and ornaments to your dorm Christmas tree and feel like you still need a little extra dorm room decoration on the branches? Add our Chocolate Glitter Ribbon! Wrap our Chocolate Glitter Ribbon for a finishing accent to your dorm Christmas tree! The neutral color of this dorm essentials item will help unite all of your holiday decorations on your dorm Christmas tree for a complete look!